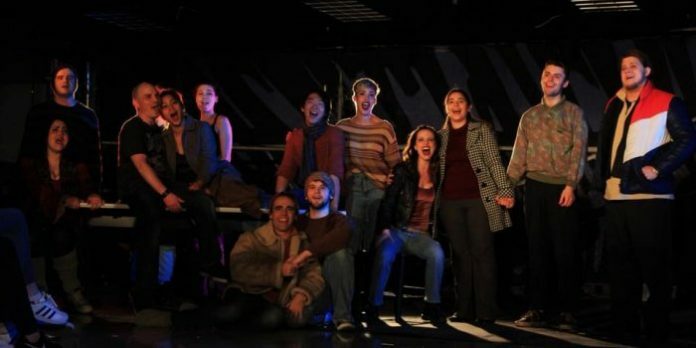 Members of the cast of the Renegade Arts Company production of Rent. Photo by M. Luro. With audiences already familiar with its story, songs, and characters, Rent comes with lots of expectations, making it a challenge for any company. The latest Vancouver company to attempt this technically difficult and iconic musical is Renegade Arts Company. 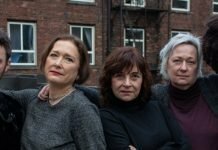 And while under the stage direction of Dawn Ewen and musical direction by Clare Wyatt, one could feel the cast’s enthusiasm for Rent, it is simply not enough to carry the show. Overall, the production felt under-rehearsed, and over-acted. Not helping was the opening night absence of the actor originally cast to play Roger. Due to illness, the role was filled by Kelsey John Torok, who, while bravely jumping into the role, was not up to the challenge. Exacerbating things even further was the poor volume balance between the music and voices. Often times barely audible as the music would overpower them, some performers also seemed to struggle, seemingly out of breath after dancing and singing. Despite the issues, Vanessa Merenda as Joanne was a standout. With her strong voice, Merenda captured the control-freak tendencies of her character, but added a depth that was also loveable. Her rendition of “Tango Maureen” with Peter MacLeod as Mark, was a triumphant success. The opening song of the second act, “Seasons of Love” was also beautiful. As the ensemble came together it felt effortless, and you could feel the enormous amount of love the song demands. The solo by Annastasia Brown did not disappoint. 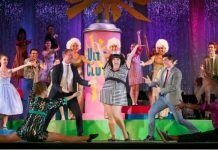 Some other notable numbers included the fun and playful “La Vie Boheme”, and the soft “Will I”, with the group numbers the strongest. Jaylen Lippingwell’s set design made good use of a strange and unconventional space. Playing with the depth of the large room, she was creative in using the black box theatre’s obstructions, including the pole at its centre. While it is difficult not to get swept up into the emotional core of Rent, this production felt more distant, especially as many of the performers took on overly dramatic and clichéd portrayals of their characters. What was evident in the room though was an overwhelming sense of love and appreciation for the musical. Everyone involved shared this passion and enthusiasm with the audience, and while this did shine through, it takes much more to make Rent really work. Rent with music, lyrics and book by Jonathan Larson. Directed by Dawn Ewen. A Renegade Arts Company production. On stage at The Shop Theatre (3030 E Broadway, Vancouver) until April 14. Tickets are available online at Brown Paper Tickets.